Join the Pound's ActNow Youth Theatre for a dynamic, challenging and fun project to create a performance based around Shakespeare's The Tempest. Perform as part of the Blue Sky festival in the Pound's professional auditorium in June. Have fun and make new friends while exploring Shakespeare, devising and improvisation. Gain skills in acting and directing, and learn about costume, lighting and sound. Develop characters and scenes to create an exciting performance based around Shakespeare's classic comedy of magic and revenge. 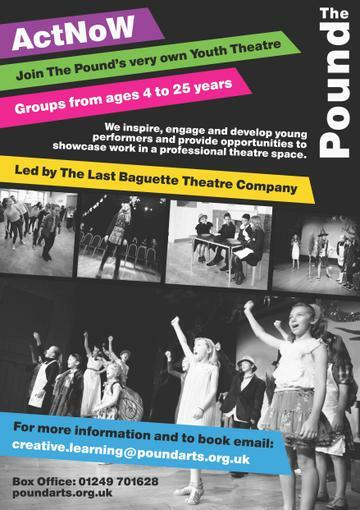 Led by actors Sidney and Tristan from The Last Baguette Theatre Company, groups are tailored to different ages and aim to inspire, engage and build confidence. There are no auditions to join – we offer places on a first come first served basis.